The need to create operational efficiency within a business is crucial. Business day-to-day activities are becoming faster paced, and it often leaves little time to care for and provide service to customers, patrons, and visitors. Interactive displays combat this issue and give you what functions like an additional employee. The display is your power tool, and the user interface and content are the batteries that make it work. Don’t let yourself fall behind when it comes to implementing the technology that will keep you ahead of the game – and follow these tools when it comes to designing what will go on your new interactive system when you do take that step. You want your display to draw attention so that people will want to walk up and use it. An eye-catching screen will stop people in their tracks and initiate interaction. Use graphics and videos to your advantage – people are drawn to moving objects and images, especially when the message is relevant to them. Make your message clear and concise and show people what they want to see, or what you want them to see. Make sure your main goal is attainable by putting the relevant buttons where everyone can see and read. Are you a library that wants a way to advertise your events more? A hospital that wants to showcase Wayfinding because people have a hard time finding their destination? Think about the main use for this system and what people will want to use it for and make that the focus. This will provide value in that what most people are looking for will be right in front of them, and when they approach they see the other benefits and features as well. 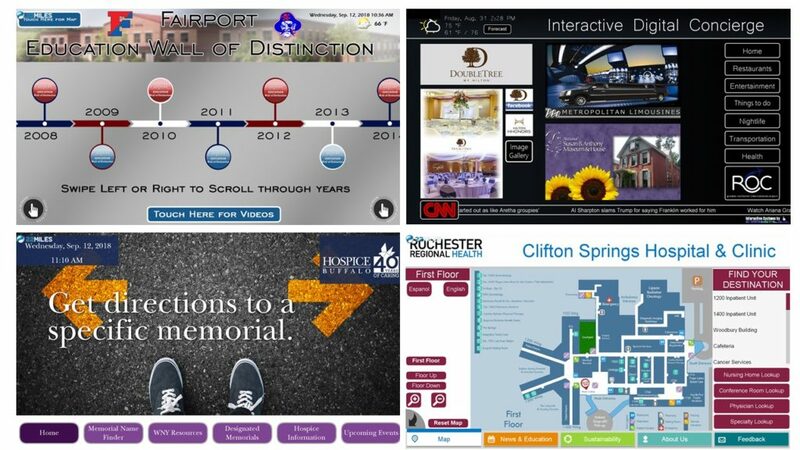 Fairport High School Wall of Distinction (top left), DoubleTree by Hilton Interactive Digital Concierge (top right), Buffalo Hospice Wayfinder (bottom left), Rochester Regional Health Clifton Springs Hospital Wayfinder (bottom right). 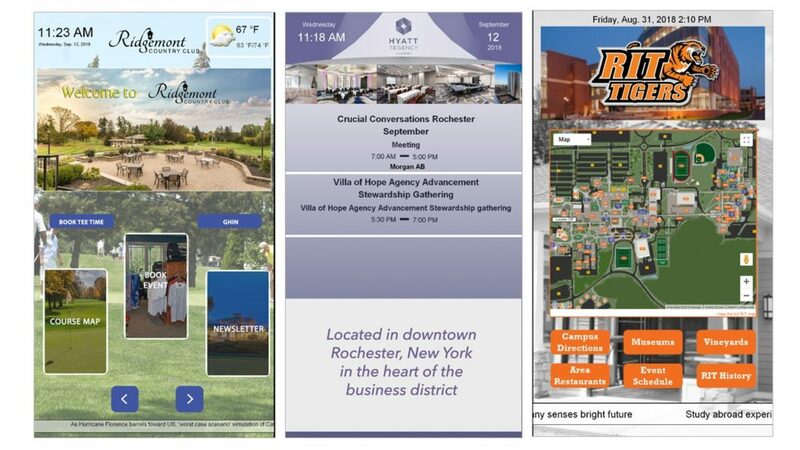 If you have a large facility or multiple tenants where people have trouble finding their way, you might want to consider making wayfinding the focus of your kiosk. By showcasing a map with the ability to touch for directions, you’re giving independence to the kiosk’s users. 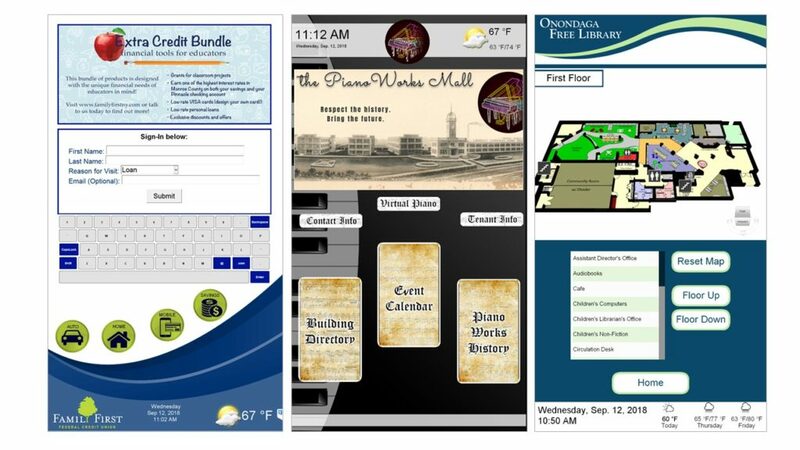 Integrate your kiosk with your calendar or other databases to show off events while informing staff and visitors what is going on within your organization. Eliminate printing costs and give people more reasons to use the kiosk! Take it a step further and even allow your users to sign up and register for events and classes. Family First Federal Credit Union Sign-In Kiosk (left), The Piano Works Mall Information Kiosk (middle), Onondaga Library Wayfinding Kiosk (right). A news feed, or even your own customized feed that shows events/news/facts is a cool and simple way to draw attention as it is always moving and updating in real time. Including things like today’s weather and date/time can assist in being a one stop shop for everything your patrons or visitors need. Bringing their heads up from their phones and onto your screen is an ideal goal and can dramatically change and better their experience. When it comes to the design of your interactive system, no solution is one size fits all. That’s why we work with you to discuss your goals and how we can accomplish them, rather than giving you a cookie cutter solution that may not work with your needs. Contact Empire Digital Signs for more information or to schedule your consultation today!